WHAT IS THIS MADNESS??? Yes, you read that right, ’tis the season to be jolly whether you are celebrating Christmas, Hanukkah, Kwannza, or if you simply like to cozy up with a nice mug of vegan hot chocolate. In the spirit of all things merry and bright, I wanted to give a little thanks back to you. Yes you. My favourite readers. So I’m running a giveaway every day for the first 12 days of December right here on It Doesn’t Taste Like Chicken- 12 days of giveaways! 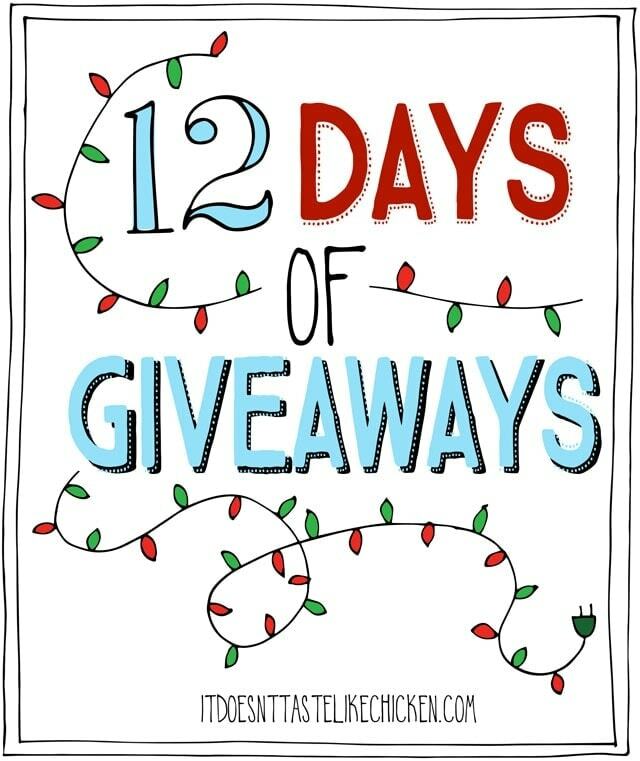 Starting Friday, December 1st, I will be launching a new giveaway each day for 12 days in a row. All the giveaways will be open for entry until midnight on December 15th. Then, I will randomly draw names and select all the winners. The winners will be announced in one major post on December 17th at 11am! Some of the giveaways will have one lucky winner, but many of them have multiple winners. Did I mention I was excited? Bookmark this post and come back every day from December 1st to the 12th to see what the new giveaway is. I will add all the giveaways to the list below every morning by 11am EST at the latest. (I’m giving myself room in the morning in case I accidentally drink too much Coconut Nog one night). Follow me on Facebook and Instagram @itdoesnttastelikechicken where I will be posting about 12 Days of Giveaways as well. All giveaways will be open to US and Canadian residents, BUT there are few giveaways that are open worldwide because I wanted to give everyone some love, so keep your eye out for those if you aren’t in the US or Canada. I will make it very clear which ones those are. Day 1: Pacifica Vegan Beauty bestsellers collection. 2 winners. US & Canada. Day 2: Veganomicon 10th Anniversary Edition. 2 winners. US & Canada. Day 3: SOULier Studio vegan shoes. 1 winner. US & Canada. Day 4: Tofuture Tofu Press. 3 winners. Open worldwide!! Day 5: Vegan Cuts Snack or Beauty Box 3-month subscription. 2 winners. US & Canada. Day 6: Field Roast Cookbook. 2 winners. US & Canada. Day 7: Moo Free Vegan Chocolate. 2 winners. US, Canada, & UK! 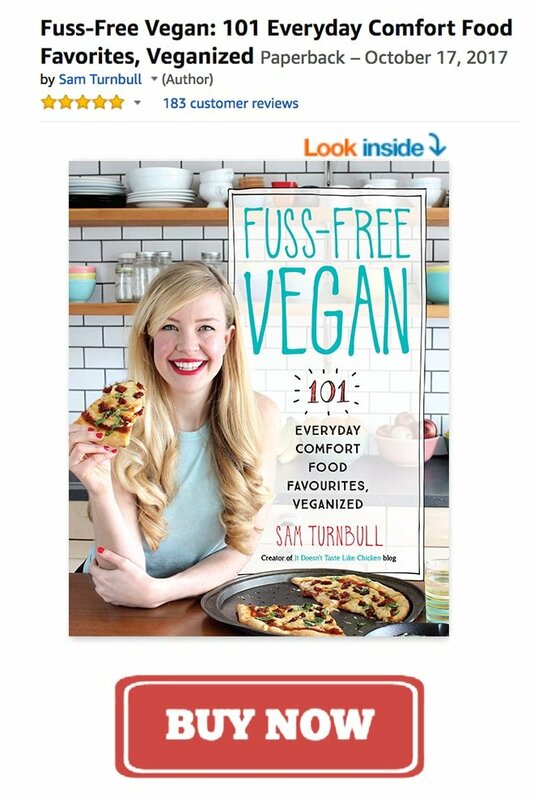 Day 8: Signed copy of Fuss-Free Vegan cookbook. 3 winners. Open worldwide!! Day 9: Pyrex Love Collection Baking Set. 5 winners. US & Canada. Day 10: Wully Outerwear Vegan Coat. 1 winner. US & Canada. Day 11: Daiya Vegan Cheese gift box. 4 winners. US & Canada. Day 12: Blendtec Designer 625 blender. 1 winner. US & Canada. That’s it! I can’t wait for 12 Days of Giveaways to begin. Happy holidays and bon appetegan! Yay! SO happy to hear that. I hope you love the book too! I recently received your beautiful book, Sam, and I have to tell you that it makes me feel all warm and fuzzy (and hungry) just looking through it. Coincidentally, I ordered it at almost the same moment my family was buying a copy from you at the TVA Christmas Market. I was very jealous that they got to meet you, but at least now I won’t have to share my copy! Love your cookbook! It’s my go to for all my comfort food recipes! Cannot wait for your next cookbook! Hahaha! Thanks so much, Mary!! I haven’t thought about a second cookbook yet… what would you like it to focus on if I did write one? I was all over the Internet looking for holiday vegan recipes for thanksgiving! Would love to have them in hard copy! Your cookbook is so easy to follow and the pictures of the results are beautiful! Noted! You can also find all my holiday sides made vegan here. I have made 2 recipes from your book so far. Sooo good! I love your book. Looking forward to seeing the variety of products. On a different note…. made your cauliflower fettuccini a couple of days ago… It is to die for. Good timing–I just made your L-C mozzarella for input into tonight’s supper!! Hi Sam! This is so exciting! When you say 11am for your daily announcement that is 11 am EST? Thanks! Continued success, Sam.